If you’re like me, you carry the full length MacBook Air / Pro MagSafe adapter cord with your portable Mac. And if you do, you’re familiar with how cumbersome having that large extender cable attached to the MagSafe is, either taking up tons of space as it unwinds, or just being a huge tangled mess. But check out this brilliant simple wrapping trick discovered Twitter by @JC. Rather than wrapping the little power cable first and trying to wrap the large power cable separately, loop the larger cord around the MagSafe adapter and use the smaller power cord to secure the thick one in place! That may sound confusing to explain, which is why it’s best demonstrated with the picture. Give it a try, it secures extremely well and it packs down much smaller than any other solution I’ve found (aside from just leaving the large extender cable out of your bag, of course). Awesome! 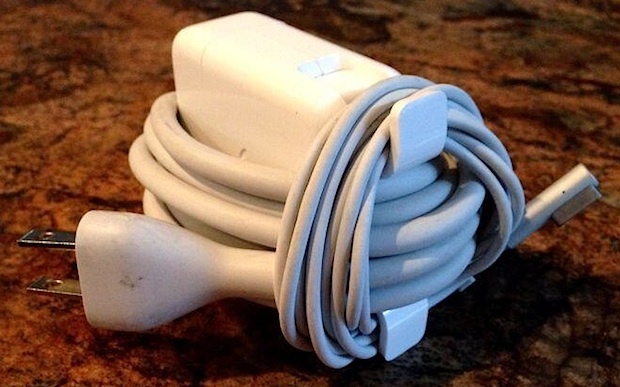 Looking for some more MagSafe tricks? You can keep the cord clutter out of the way by clipping it to the side of the screen, or jump directly to the land of leisure and use a MagSafe adapter to open a beer bottle. OK how did I never think of this? And judging by everyone on my Twitter mentioning this, how did NOBODY else think of this?? Or you could use the travel adaptor like from an old airport express or the battery charger. Your comment is absolutely correct. It is imperative not to create a sharp bend in the small cord where it connects to the power adapter no matter where or how you wrap it. Repeated bending of the small cord at the connection point will inevitably cause the cord to break at that point. It would have been a much better design if the small cord unplugged from the adapter. Nice tip, though it makes the power supply rather fat. I just coil the NEMA plug cord in a loop large enough to go around the power supply to fit as flat as possible in my backpack. I used to do it like this and it just broke the plastic of the wires. Those wires are really cheap and they don’t last for a long time when they are twisted too tight. This just saved me HOURS in the Apple store- thank you so much!